Tonight I'm drinking Dirty Helen Tavern Style Brown Ale brewed by Barley Island Brewing Company in Noblesville, Indiana. Yep! Beer 4 from Trade 2 with Marathon Marie. Now I've never been to Indiana, and I don't really know Marie except from her blog and Twitter and, well, never mind. I guess I get her. But how she figured out to get a beer with my mother's name I'll never know! Dirty Helen seems to be a badge of honor nickname as the bottle states, "Bold, delicious handcrafted ale with the reputation of a legendary tavern owner." Not sure how my mom will take it when I show her the empty. I remember my dad getting whacked across the head years back when he suggested the Fine Young Cannibals song "She Drives Me Crazy" was about my mother. Hmmm. Rich, sweet, malty caramel and brown sugar aroma, just a hint of nuts and very inviting. Similar flavors, sweetly starting with caramel and brown sugar. My first observation is that this beer is quite a bit thinner than the aroma led me to expect. 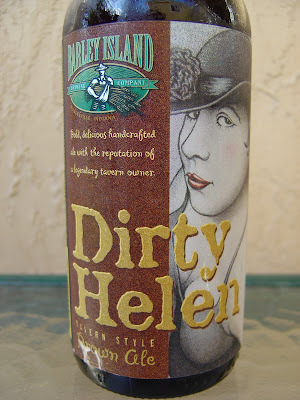 Heck, the voluptuous lady with the red lipstick depicted on the front of the label, who I am assuming is Dirty Helen, has way more body than this beer. Thanks, Barley Island, for the cleavage on the portrait, too! Back to the beer, a nutty flavor is present but distant. Rather some spicy ginger and cinnamon play a more prominent role in defining the profile for this beer. Nice smooth texture; medium carbonation is great too. That initial sweetness is toned way down along the way as well, a nicely-balanced beer. The finish does have an exam room taste to it, but all-around, not a bad beer at all. Check it out if you can. One last question: does the lady on the label remind you of anyone? And don't bother with any "Your Mom" answers. i had this on tap at barley island in broad ripple early last year, but they had like an "extra" dirty helen that had brett in it. awesome. The question is, is it the exam room of a first-rate hospital facility or is it the exam room down at the free clinic? Because that would make a difference. I've only had this one on tap so I was curious to find out how it tasted in real life. I had her sister, Sheet Metal Blonde this weekend and it was pretty ok.
Hey Brian. The extra dirty helen sounds pretty cool. Marie. Definitely a clean facility with plenty of antiseptic and tongue depressors. this picture reminds me of boy george, which to my knowledge, was not a women...eek!